I haven’t been very active lately. 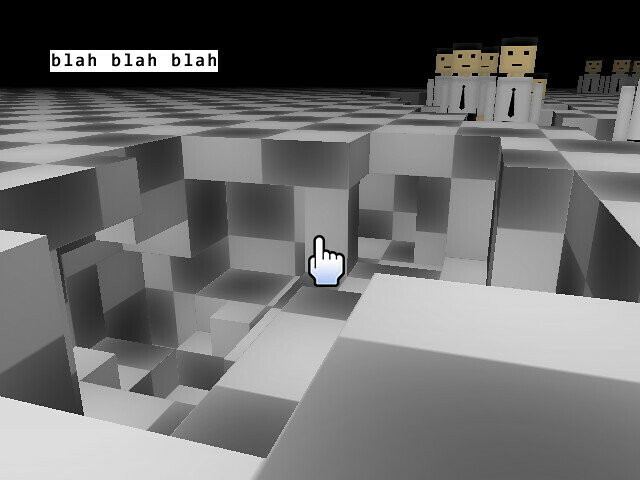 But I have done a bit of work on updating Cubicle Shooter. You can now shoot and hurt the people. They get pushed back when shot. When the people get too close to you they push you and hurt you. Both you and the other people bleed when hurt and the blood paints the ground and walls. Your health regenerates (up to one hundred) but if it ever drops to zero then the game will reset. There is a scoring system which rewards you with 25 points every time you shoot one of the people and an additional 100 when you kill one of them (they die after four hits). You can now save the game and load a previously saved game. Saving and loading is extremely slow on Wii. You are taller now but can crouch back down. 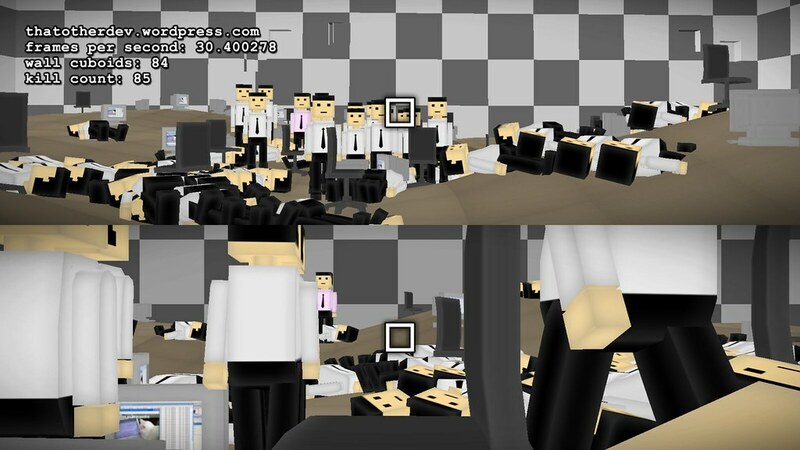 Just like in the PS3 version you will automatically crouch if you don’t have enough room to stand. There have been changes to the controls. The newly added background music is a song called Homeless and was created by Julien Lussiez. I had intended to get more done before posting it but I’ve been very lazy lately so anyways here is the first demo of Cubicle Shooter for Wii. 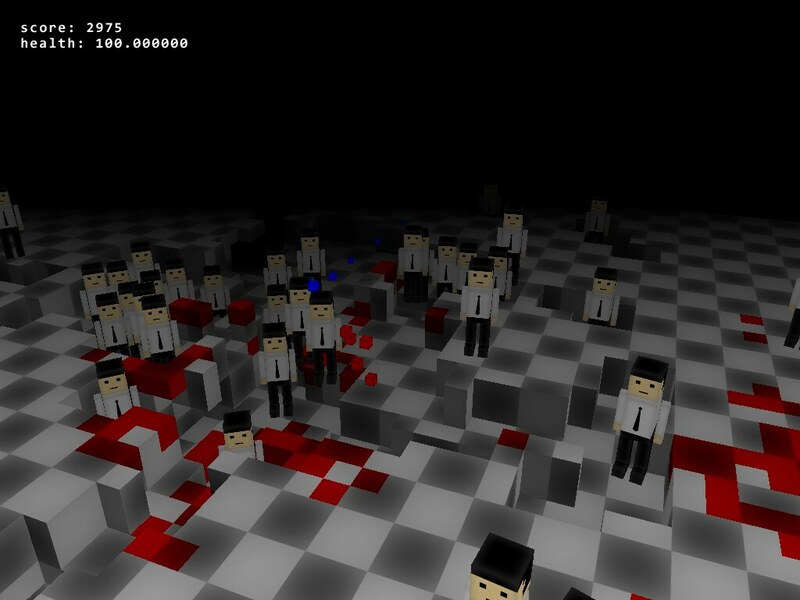 Cubicle Shooter is a first person shooter with a focus on highly destructible environments. It is very incomplete and is really just a tech demo right now. My plans for it are essentially the same as what I was planning for the original PS3 version but it is more of a remake then a port. Everything is being completely re written. There is also now a PC version. Use the nunchuck analog stick to move, the wiimote cursor to turn, the A button to jump and the B button to shoot. Here is an updated version of Cubicle Shooter! You can now shoot other players in split screen multiplayer (still no player death but you get pushed back when shot). You are taller now. You can crouch back to your previous shortness by holding down the right analog stick. You automatically crouch when there isn’t enough room to stand. Enemies in multiplayer will approach the nearest player (they would previously only follow player one). Enemies no longer spawn inside the cube at the start of the game so you wont encounter them until you blast through the wall (It was beginning to feel a little bit too crowded). The kill counter has been replaced with a score system. You get 10 points each time you shoot a cubicle dweller. The scores are tracked separately for each player. textured stars onto the sky. Set a limit to how deep you can dig into the ground (the limit is fairly deep and I don’t expect it will be a problem for anyone). Fixed the scope in multiplayer. I believe I’ve corrected what was causing the previous version to crash for a lot of people. Let me know if the second player controls are working. I only have one controller to test with.